Minimize the risk by always keep the pads clean. Brush the foam pads often. Wash carefully by hand and let them drip dry. Use spurs to clean wool pads. Avoid washing wool pads, due to shrinking. Compound is a gritty material so do not use a buffing pad for finishing work. Keep pads separate! Use the right pad to the right polish / compound. 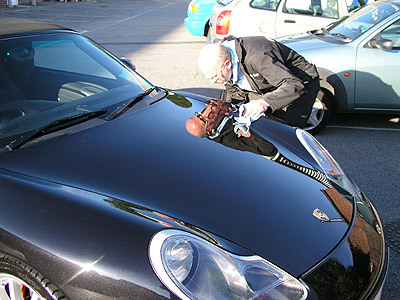 Save time by buffing a small area and check the result. There are so many kinds of pads, I recommend you start up with the least aggressive material and work you way up to the most aggressive, if you need. Try to stay between 1750 - 2400 rpm when buffing and 1400 – 1750 rpm when finishing. Low speed means less friction, less friction means less heat built up. When you have finished buffing, wash the car! This eliminates the risk of excess grit remains before finishing work begins. When finishing with polish or wax don’t buff the surface to dry. Leave a little material on the surface, if not you will create friction (and the risk of swirls). A final hand wax or using an orbital machine, will clean up eventual residue. Preparing the paint is of utmost importance, not only to get the best possible result, but also to make the buffing easier as well. 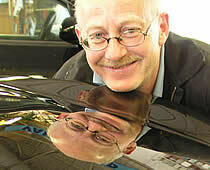 Wash the car carefully and then go over it with a clay bar to clean the surface from contaminates. Start the buffing with the pad at a slight angle to the surface and finish with pad totally flat. Put the material on the car, not the pad. Work in small areas (40 x 40 cm – the width of your shoulders), and find your rhythm and pace. Let the weight of the machine do the job. Don’t wear yourself out and work the machine. Try to move the machine not more than the width of your shoulders. And don’t work against the machine. Keep the machine moving all the time to avoid burn marks. Be careful with beadings, mouldings and other sensitive parts on the car. Avoid them or use masking tape. Buff the car from right to left in a comfortable motion. Watch out for pad destroyers like antennas, windshield wipers and emblems. A careful approach is the best, but mask or remove is even better. Avoid edges by masking or work in different directions with the pad at lower speed. I recommend masking if you don’t feel comfortable with the machine and have a good touch.